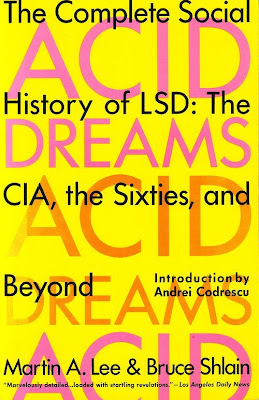 From Brain music to more Brain music to Acid Dreams - which tells the story of the links between the CIA and LSD. A lot of names from the music industry appear in the book, and they are not all the usual suspects. It includes the story of how André Previn took part in a study of the effect of LSD in the late 1950s carried out by Dr Oscar Janiger, a Los Angeles psychiatrist. Acid Dreams was a chance find a few years back in the gem of a bookstore in Avignon, France, run by Wolfgang Zuckermann, who was, also by chance, supplier of harpsichords to John Cage in an earlier life. I last met Wolfgang Zuckermann when I was in Avignon in December 2008 in search of Olivier Messiaen. And, also by chance, Messiaen died on 27th April, 1992, which is seventeen years ago today. You can relax, Messiaen is not in Acid Dreams. But that didn't stop him thinking outside the box. nice meandering path...always wondered why the acid generation didnt turn on to messiaen?